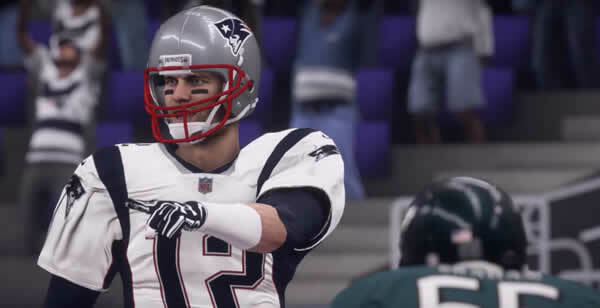 First things first—a Madden simulation of any NFL game is not something to base your online Super Bowl betting off of—but, it is an interesting representation of what can happen in a game. Also, sometimes Madden and other simulations come eerily true. CBSSports ran a Madden simulation for the 2016-2017 season and saw the Atlanta Falcons winning the Super Bowl. While this did not happen, the Falcons came close and should’ve won that game. The network ran another test on the outcome of Super Bowl LII and the results point in the direction of one of the most exciting championships to date. In this Super Bowl LII simulation, the Eagles elected to receive the ball first. They drove all the way down to the Pats’ 1-yard line on their opening drive, but were unable to score a touchdown. They settled for a field goal instead. The Eagles defense managed to hold the Patriots to a 3-and-out on the subsequent drive. Then, Pats CB Malcom Butler, who is famous for catching the game-sealing interception against the Seahawks in another Pats Super Bowl win, forced a turnover via fumble. The first quarter ends 3-0 with the Patriots in possession. The second quarter picks up with the Patriots capitalizing off the forced fumble. After securing the ball near midfield, New England drove down the field and scored on a third-and-goal run from RB Dion Lewis. The game sat at 7-3 for another Eagles drive (which amounted to nothing) and then New England scored another field goal to make it 10-3. Philadelphia finally managed to score via a connection between QB Nick Foles and TE Zach Ertz. The Patriots were left with :55 seconds in the half, but in Tom Brady’s world, that may as well be a whole game. The Pats drove down the field and put up another Stephen Gostkowski field goal to take over at 13-10. New England started with the ball in the second half. They added another field goal to expand their lead to 6. The defense holds stout and forces Philadelphia to punt the ball. Then, Tom Brady connected with WR Chris Hogan for a touchdown. The Pats go for a 2-pt conversion and secure it through WR Brandin Cooks. This puts New England up 24-10 heading into the fourth quarter. Normally, a lead like this would secure a victory, especially with the Patriots, but this is where things got interesting. The Eagles manage to score a field goal on fourth-and-1, minimizing the point differential to 11. While not going for it on fourth-and-1 in this type of situation is an interesting call, it ended up working out. A Patriots touchdown would’ve likely cemented the lead, but instead Tom Brady threw a pick to Eagles S Rodney McLeod. The Eagles also capitalize on their turnover and score a touchdown through a RB Jay Ajayi rush. They elect to go for 2 and successfully convert through Zach Ertz. Now, at 24-21 Pats, the Eagles were in survival mode. The Eagles special teams unit blocked a punt and ran it back for a touchdown. This created a 28-24 score with 5:24 to go. The Pats almost scored a 60-yard touchdown on the next drive, but Hogan dropped the ball and the team punted. Then, in true Brady fashion, an 87-yard play to Cooks put New England back in front with :57 seconds left. At 30-28, the Pats lined up for an extra point. Then, the Eagles blocked the kick and ran it back for 2 points to tie the game. After a failed drive, the game went to ovetime. The Pats won the coin toss but were held to a 3-and-out. The Eagles took over and made it about halfway. Then, on a fourt-and-1, they decided to go for a 58-yard field goal. K Jake Elliot missed. Brady and Co. got the ball back and scored to win their 6th Super Bowl since 2001 on a 52-yard touchdown to WR Danny Amendola. Again, while this simulation falls more into the eSports betting category, it does pose a potential scenario for Super Bowl LII. Experts have the game at a close spread, meaning they expect it to be back and forth. If Super Bowl LII plays out like this simulation outputted, then legal betting online participants will win their Pats moneyline bets. The spread will also be covered along with the over bet on the combined score.